Selection of mowing height is probably the most important decision in mowing. 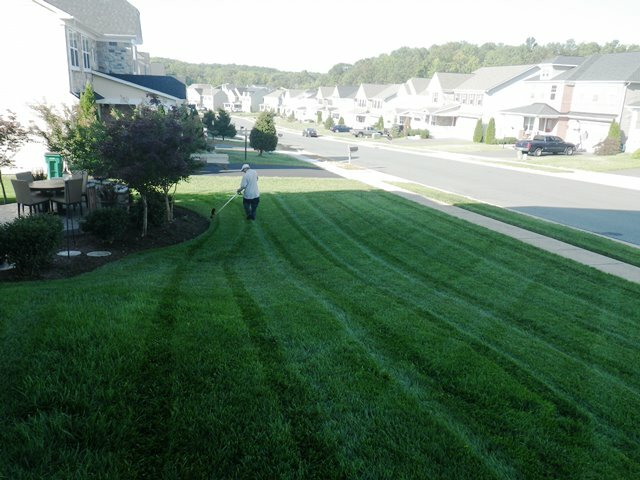 There is no doubt that mowing is a stress-creating management practice. Each specie of turf grass has a mowing tolerance range, at which it can exist over a broad range of climatic conditions with minimum stress and and still be expected to provide a satisfactory turf. 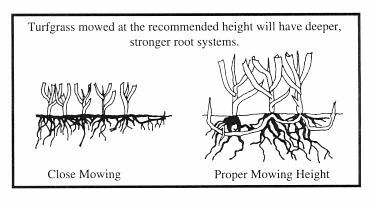 If the turf is mowed too short, it tends to become denser, but have less growth of roots and rhizomes. This also makes the turf less tolerant of environmental stresses, more disease prone, and more dependent on a carefully implemented cultural program. The smaller, shorter root system requires more water and fertilizer to compensate for its decreased ability to secure and hold moisture and nutrients from the soil. Turf grass shouldn’t be cut shorter than 3″, because the foliage area contains enough number of chloroplasts for photosynthesis to be possible, a good amount of stomatal openings are useful for breathing and transpiration to avoid damage to your Lawn. The leaves of grasses are food factories. They absorb carbon dioxide from the air and intercept sunlight. Green plants use the sun’s energy to power the chemical reactions involved in photosynthesis-production of food and oxygen, using water and carbon dioxide. In grasses, most photosynthesis occurs in the leaves. Removing too much of the grass blade can limit food production. Start and stop dates may vary according to weather conditions.